Home > This Developer's Life > Flexible Working Hours – You Can Work From Home! The thing is this, if you can show me one good reason why companies do not allow employees to work from home (or keep flexible hours) then I will stop doing it myself. I have been telecommuting for 8 and a half years. I am sure that this somehow does extend to the actual job an employee does. For example, having a delivery person work from home might not be a good idea because they need to be AT the company in order to do their job, right? Seeing as I am a software developer, this article will focus on programmers. Why don’t more programmers telecommute? The actual question is two-fold. Is the company they work for flexible and innovative enough to allow this? 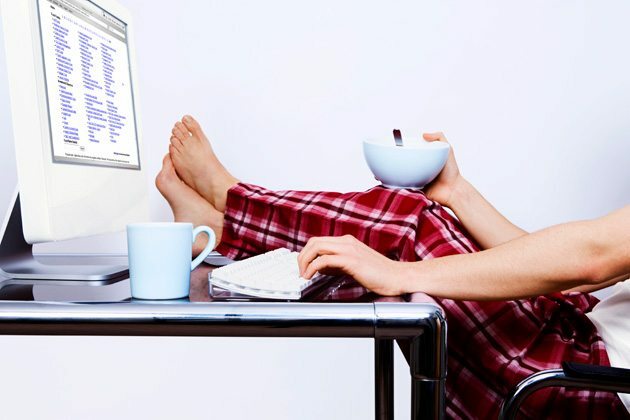 Would programmers even want to work flexible hours from home? I’m sure that there are a lot of you that would undoubtedly answer yes to the second question, but let’s take a closer look. Do you know how productive you would be if you had to work from home ? What are the things that would destroy programmer productivity if you had to have a home office? Working from home has benefits, but there are pitfalls too. 1. Does your company or boss seem open to the idea? While it is true that many companies are embracing the culture of work-life balance and working from home, many companies do not subscribe to that point of view. That brings me back to the LinkedIn quote above. Why hire employees in the first place if you can’t trust them enough to work flexibly? A survey done by PGi showed that 80% of those surveyed were allowed to work from home. This shows a definite trend by employers in recognizing the benefits of remote workers. A whopping 82% of employees reported that working from home reduced stress. I can tell you from personal experience that this is true for me too. 69% said that absenteeism improved. I have not had a single sick day this whole year. Last year, I only took 1 day’s sick leave. 70% reported improved productivity. I can put in a full 8 or 9 hour day. 80% said that there was a definite improvement in morale. 2. What are some of the pitfalls? There are however some that would consider working from home a career limiting move. Personally I have not experienced that at all. Some even say that collaboration is worsened and that meetings aren’t as effective (as if meetings ever could be 100% effective anyway). Any forward thinking company can easily work around these issues. Collaboration is easily overcome by various collaboration products available, and as for meetings? Well there’s always Zoom that can assist if a few of you need to sit around a virtual table and discuss ideas. A lot of these issues are things that you would need to work through. Loneliness is a challenge, but easily overcome by surrounding yourself with the world around you. Listen to podcasts while you work. John Sonmez has a great list of podcasts for Developers. I love listening to Leo Laporte’s This Week in Tech. Check out his shows, you will be glad you did. Having a work area separate from your home area is essential. If you’re going to be working from the kitchen table, then you might want to rethink your decision to work form home. You must have a dedicated space as your office. It needs to be separate from your home and relaxation space. If the two mix, you either will never leave work, or you will never be at work and be unproductive. Give yourself an extra room in your house if you can. Managing your time and being disciplined enough to work is really a no-brainer. If you’re going to goof off when working from home, chances are you would have done it at the office anyway. Just don’t do it. We’re all grown up and mature people now. If I want to go watch my daughter practice sport in the afternoon, I go. Some mornings I enjoy a breakfast with my wife after dropping the kids off at school. We make a date and go have breakfast at our favorite coffee shop. Sometimes my son wants me to play with him a bit after school. I am free to take 15 minutes and we lie on the carpet in his room playing with his trains. He just wants a little bit of my time, and then he is satisfied and plays further himself after I have left. 4. But what about my boss? You can give your boss all the stats and research available on why working from home is beneficial to employee happiness. If he/she isn’t open-minded about this concept, you’re going to have a tough time convincing them. Before going to your boss, do your homework. See if telecommuting would indeed benefit the company you work for. For example: Research employee absenteeism in the company and put these stats down on paper (Use graphs and pie charts if you must. Bosses always love these). Explain that you would like to discuss the possibility of working from home and motivate your reasoning for wanting to do so. Explain the benefits and research and ask your boss what their feelings are on the subject. LISTEN to the reasons if your boss seems hesitant about the idea. Take the concerns to heart and discuss these openly and honestly. Suggest a trial run of allowing you and the other employees to work from home 1 day in the week. Give the trial a definite start and end date. Use the research you did earlier as measurable KPI’s that you can observe during the trial run. Dis absenteeism decline? Did productivity improve? Allow your boss to manage his or her risk. Chances are, they have a boss too and taking flac for employees naturally filters down. So make it as risk free as possible. Whichever way you choose to approach the subject, don’t go to your boss on a whim. 5. I can never go and ask my boss for that! Be prepared, be well researched and have your facts straight. The benefits of working from home far outweigh the negatives. If you manage it correctly, you and your company will definitely reap rewards never dreamed possible. Now I can already hear many of you thinking that you could never go to your boss with a request like that. My challenge to you is why not? If you don’t feel comfortable enough discussing something like this with your boss, then you need to ask yourself the following question. Do you consider your boss as unaproachable? If you do feel this way, then how happy are you in your job? Do you love your job but put up with your boss? You do realise that you can love your job at a different employer too? In fact, you are not a tree are you? Have you considered looking for another job? What about doing some consulting work on your own time or starting your own company? If your boss is making an island of you, where you keep all concerns and problems to yourself then you really need to question the current employment situation you are in. Do you think it is healthy? You boss should be someone you can confide in, not abide by. I realise that there is a lot more at stake here than just a simple employer-employee relationship. I also know that many of you will differ from my opinions expressed here. The real end product I’m trying to achieve here is to make you do a bit of introspection. To see what makes you and those around you tick. I want you to stop just accepting things for how they are and stop just going with the flow. I want you to feel great about what you do and I want you to be the best you can possibly be (and then some). This Developer’s Life is a series of articles that will focus on doing just that. So stick with me in the coming few weeks. Let’s see where this leads us.